Trust me, there has been no crying over my recent acquisition of Bobbi Brown Extreme Party Mascara. Ever since I started using this gleamy little tube, it seems like my lashes have perked up about a thousand times more than normal! To begin with, the tapered brush coats each and every single lash -- even the baby ones! I have many fine, tiny lashes at both the inner and outer corners, and this mascara somehow grabs every single one with ease. None of that poking the brush into strange spaces, trying so hard to get to those unreachable lashes -- it's almost like this brush does the work for me! And my lashes, once they've been coated with this wondrous formula? They're thick, lush, so-long-they-hit-my-glasses fabulous. I've gotten compliments on my lashes everywhere from gals at my office to airports and the checkout line at the grocery store. Life is most definitely a party. 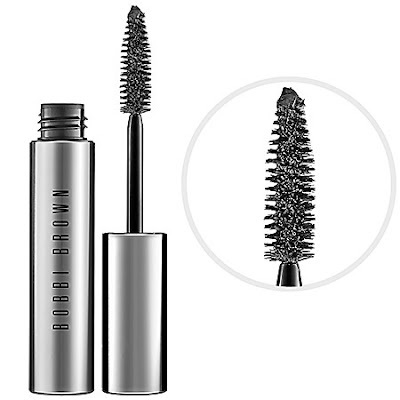 Bobbi Brown Extreme Party Mascara retails for $25 at sephora.com.